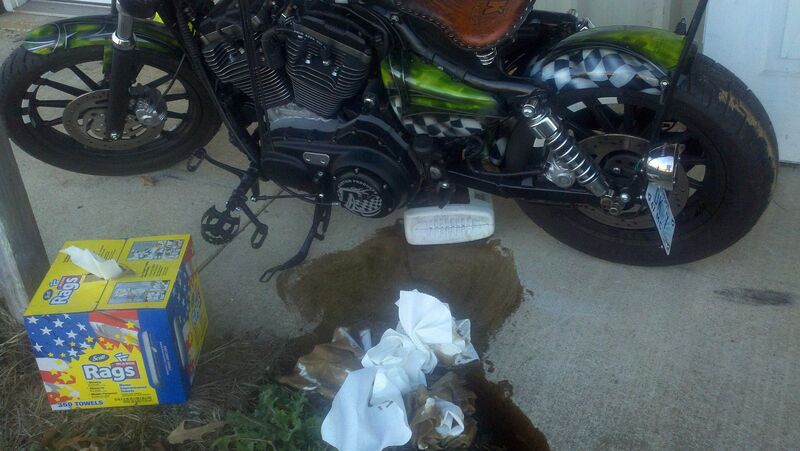 Harley Davidson Forums - What did you do to Your Sportster Today? Riding the bike to the shop I rode up a lip onto the walkway. Parked and went into the shop. About 30 minutes later I stepped outside and did a double-take! There was a big puddle under my bike, and it was growing! I took a quick look and saw it was coming out the oil tank drain hose, around the plug. Devin grabbed a drain pan and some towels. Here's a pic of us part way through mopping up the oil. After all the oil finished draining out, it was easy to see what had happened. 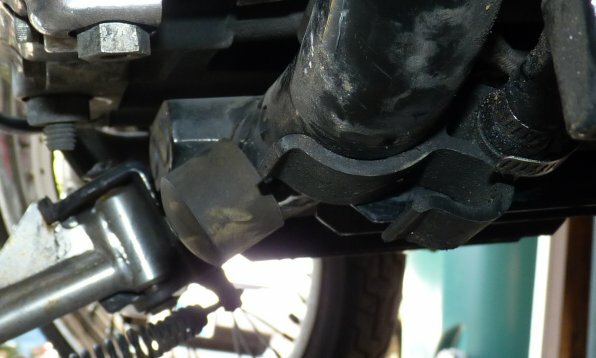 The hose clamp had got pinched between the cement lip and the frame, deforming it. It no longer was keeping the hose in a tight seal around the plug. I have ridden up that lip onto the walkway dozens of times...but this time it caught that hose just "right". We put the plug back in with a new hose clamp, replaced the oil with some new oil. And NOW I have done what I always thought about doing, but never did....zip-tied that hose up so it is no longer the lowest hanging part at the bottom of the bike. My 1200C tucks up next to the frame, not under it, but I've wondered if a good tap could break the clip holding it there. And if that dropped down, could something catch it and rip it off? A zip tie next to that plastic clamp sounds like a good idea. Sounds like you're lucky you didn't have to replace a busted plug, too. Wow, how weird is that? 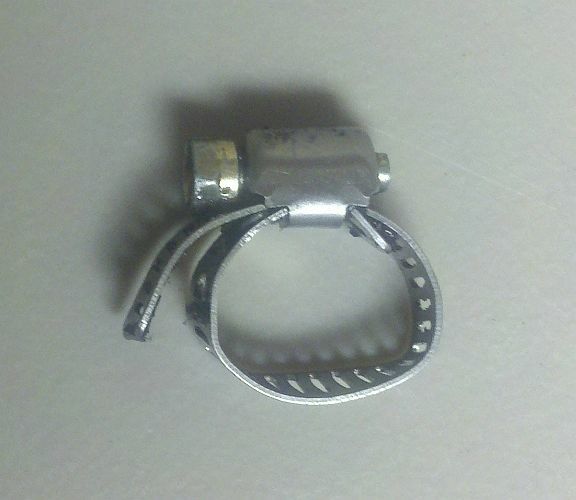 I didnt like the worm drive hose clamp anyway and use a fuel injection hose clamp on mine but I bet it too would have been deformed. I glanced at my 48. It's been hooked-up to the tender with no rides in the near future. I got my oil to operating temp and 75 miles later I parked it. It was t shirt riding weather today. 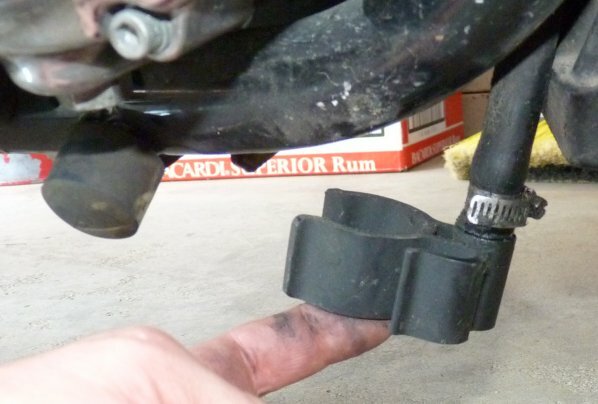 Imod, use a zip tie through the hollow spot between the drain tube and frame clamp. Husband put my christmas present, my tour pack on my ride....then went for a ride to finish shopping. Was no jacket riding weather.....was grrrreat!! See what you mean, looks like the best spot, thanks. Picked my 883L up from the getting repaired after my accident a month and half ago. Upgraded the stock headlight with a PIAA extreme white bulb, and turned the rear signals into run, turn, stop lights. Also made all the rear lights flash when breaking. I covered it and waxed the tank and fenders and dreamed of riding it. Temps were in the 50's but we have about 5" of snow to melt. Looking for a jack to lift the bike up so I can install the detachable backrest. I covered her back up, put the tender back on. Now it's on to the HD parts and accessories catalog.